This is what the government’s Industrial Strategy is all about. Clean growth, one of four grand challenges identified by the government, means reducing carbon emissions while growing the economy, and offshore wind does just that — the newly-announced Offshore Wind Sector Deal is extremely timely. It will ensure that the highly innovative industry which I am excited to be a part of continues to position the UK centre-stage when it comes to clean growth. We should all take pride in the fact that our country is the world leader in offshore wind, with more capacity installed than any other nation, already generating enough electricity to power more than seven million homes. We have the biggest offshore wind farms in the world as well as the world’s most powerful turbines. But we have only just begun. Based on the certainty provided by the Sector Deal, our capacity is set to grow exponentially, from nearly 8GW today to at least 30GW by 2030. The pipeline of Contracts for Difference (CfD) auctions to be held every two years will encourage investment in the UK supply chain and enable us to deliver one-third of the country’s electricity from offshore wind by the end of the next decade. This is an ambitious, long-term, transformative strategy; a close partnership between industry and government which demonstrates how offshore wind will play a central role in a low-carbon, affordable and reliable electricity system for industry and domestic consumers alike. Our supply chain extends to every part of the country, with many firms located in emerging clusters of activity creating centres of excellence, and companies ranging from catering services to SMEs and to large multinationals up and down the coast benefitting from this clean growth boom. 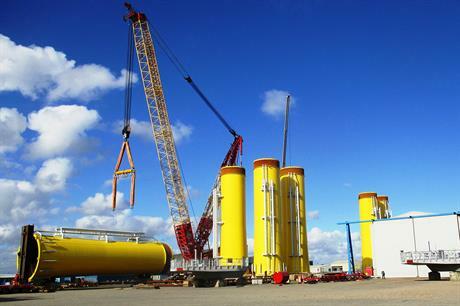 As a result, the UK leads the world in designing, building and operating offshore wind farms, optimising their performance to help continue driving costs down, as well as manufacturing blades, turbine towers and cables. Offshore wind is already revitalising coastal communities around the UK including Hull, Grimsby, Hartlepool, Barrow-in-Furness, Aberdeen, Mostyn, Lowestoft, Great Yarmouth and the Isle of Wight. As a central part of the Sector Deal, the industry will invest up to £250m (€289m) in developing the UK supply chain further and faster between now and 2030, increasing productivity and improving competitiveness. This includes an investment of up to £100m in a new collaborative industry programme, the Offshore Wind Growth Partnership, which will offer practical help for companies seeking to win contracts in the rapidly-growing offshore wind market. This ground-breaking programme will help deliver a globally competitive supply chain; our global pre-eminence means we are uniquely placed to sell our innovative products and services overseas. We are already exporting our technology to more than 20 countries. With this Sector Deal, we expect to increase our export value five-fold to £2.6bn a year by 2030, as well as increasing the UK content of our new wind farms here in the UK, from 48% today to 60% by 2030. Overall, we expect the domestic and export market to grow to nearly £5bn a year by the end of the next decade, in a global market worth over £30bn a year. To support this rapid growth, the offshore wind sector expects to employ at least 27,000 people by 2030 in skilled, well-paid jobs. As part of the deal the industry is setting up a new body to develop skills; the Investment in Talent Group. We will grow the number of apprenticeships we offer, as well engaging with people with relevant skills from other sectors such as former military personnel, to help them join the offshore wind success story. We will collaborate closely with our colleagues in industries such as oil and gas, as well as the nuclear and automotive sectors. My colleagues and I in the Industry Council are committed to improving diversity in our sector. We need to cast our net as widely as possible into the pool of talent which is out there to maintain our lead, so we have set ourselves a target of 33% women employees in offshore wind by 2030, up from 16% today, with an ambition to reach as high as 40% if possible. And we have committed to setting a target later this year to ensure that BAME communities are well represented. The UK is an offshore wind innovation hub, with world-class test facilities producing cutting-edge technology, such as the world’s first floating offshore wind farm, as well as developing the use of robotics and AI. Government and industry will continue to invest in collaborative R&D to increase our competitiveness, working with British universities, developing high-value UK intellectual property. Our expertise is a highly valuable commodity in the global marketplace. New offshore wind farms are already cheaper to build than fossil fuel alternatives, and the next projects will see further cost reductions, helping to keep consumers bills down. The value for money argument now means that developing offshore wind has become an economic imperative, as well as an environmental one. Having sealed the Sector Deal, we have set ourselves on the right course as a global leader in clean growth, with offshore wind as the backbone of the UK’s modern energy system, and a key technology in the government’s visionary Industrial Strategy. This article was first published on the UK's Industrial Strategy website.